The entire platform at your fingertips! Access to hundreds of suppliers, as well as your bookings, trainings, news, industry trends, commissions, and so much more! Founded in 2003, Pro Travel Network supports one of the largest professional independent travel agent networks in the world. With more than 4,000 Independent Travel Agents throughout North America and bookings totaling more than $500 million since 2003, you have the opportunity to become a part of one of the leading companies in the industry. Our offices are located in both the U.S. and Canada, but our company also expands globally. We are strategically positioned to continue to participate in the phenomenal growth of the $8.1 Trillion annual travel industry, as well as the unprecedented growth of the professional home-based Independent Travel Agent industry. 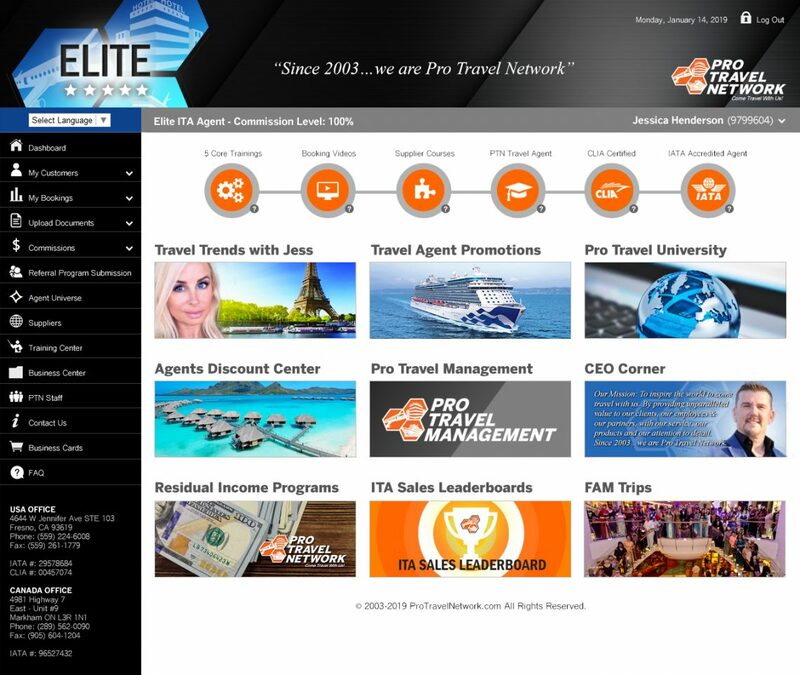 Why become a Licensed, Home-Based Independent Travel Agent with Pro Travel Network? You also have the opportunity to earn free trips and explore the world with us on our annual group trips that are designed to celebrate your success! A good ITA can not only provide a client with the same great deals, but an experienced ITA is also invaluable in making sure the client gets the vacation they truly wanted. Furthermore, the added personal service, attention, sage advice, and travel tips are no charge. No wonder nearly 80 percent of all cruises, vacation packages, destination weddings, honeymoons, and group travel is made using an Independent Travel Agent. Since 2003, Pro Travel Network has been one of the leading travel companies in North America and the #1 Host Travel Agency for ITAs in the industry. Pro Travel Network has booked tens of thousands of family vacations, cruises, flights, hotel packages, honeymoons, and all types of group travel for our network of satisfied customers. As Pro Travel Network enters its 16th year in business, we have expanded on our initial vision of becoming one of the largest travel agent networks in the U.S. to now becoming one of the largest travel companies in the world. Being a Pro Travel Network ITA isn’t for everyone. It takes a financial commitment, time commitment, and tremendous effort to build a successful travel business and keep it thriving. PTN ITA’s are highly trained in all of our sales platforms. Whether it’s leisure travel, corporate travel management, or our discount membership and incentive platforms, each and every ITA and their team will a have a full corporate management team and support staff working for them.